PURPOSE OF THIS BLOG. It is to equip, edify and encourage born-again Christians so they can be effective in their witness. Along with topical type Bible teaching, it will supply other tools(inc videos)to inform,warn and alert believers within these last days of deception. It exposes the dangers of heresy,apostate church,ecumenism and deception.It also presents arguments against atheism and faulty evolutionary teaching, plus why the Bible can be trusted as the WORD OF GOD. Click this link Articles Carrying Most Comments as at 30 November 2011 a league table of articles carrying the most comments. "And, behold, the veil of the temple was rent in twain from the top to the bottom; and the earth did quake, and the rocks rent; And the graves were opened; and many bodies of the saints which slept arose, And came out of the graves after his resurrection, and went into the holy city, and appeared unto many. Now when the centurion, and they that were with him, watching Jesus, saw the earthquake, and those things that were done, they feared greatly, saying, Truly this was the Son of God." Muslims state that Matthew must have been lying because such a momentous event like this would have been reported far and wide and yet only Matthew reports it. However, I would submit that the reason the writers of the other gospels did not mention the multi resurrections was because they were not direct eyewitnesses of it. Remember the 4 gospels were based on the actual events/speeches that were witnessed/heard by the eyewitnesses (except Luke who collated his findings/investigations together from the other eyewitnesses and is remarkably consistent with the other 3 gospels). It could be that only Matthew saw it happen. Maybe Mark and John didn’t see it happen and therefore (as faithful witnesses) did not write it down as they only wrote down what they themselves had seen and heard. In These Days Of Apostasy, Why Follow Leaders? This is just a brief article, to be linked to another article, written because of the multiplicity of questions received as to whether I actually recommend any good leaders, at all. There were many that I respected and believed to be genuine followers of Jesus, not caught up in the ecumenical train towards Rome. However, as time has gone on, many of these have succumbed. Therefore I do not want to write such a list in case further leaders also succumb. In any case, should we be looking to leaders or to Jesus for our Christian growth and maturity? I wrote an article (at the bottom) which includes a long list of those with ecumenical/new age etc ties. I made the point that just because their name appeared, did not mean I was calling them false. which were illustrating how very close we are to the rapture and the Second Coming and the times of great tribulation on the Earth. Therefore, we need to rediscover or learn how to get close to God, now, so that we are ready. As Jesus said “watch and pray” and “when you see these things happening, look up for your redemption is drawing near”. showed the evidence and signs of how very close we are to the rapture of the church and to the last 7 years before the Second Coming (which includes the worst time ever on planet Earth). 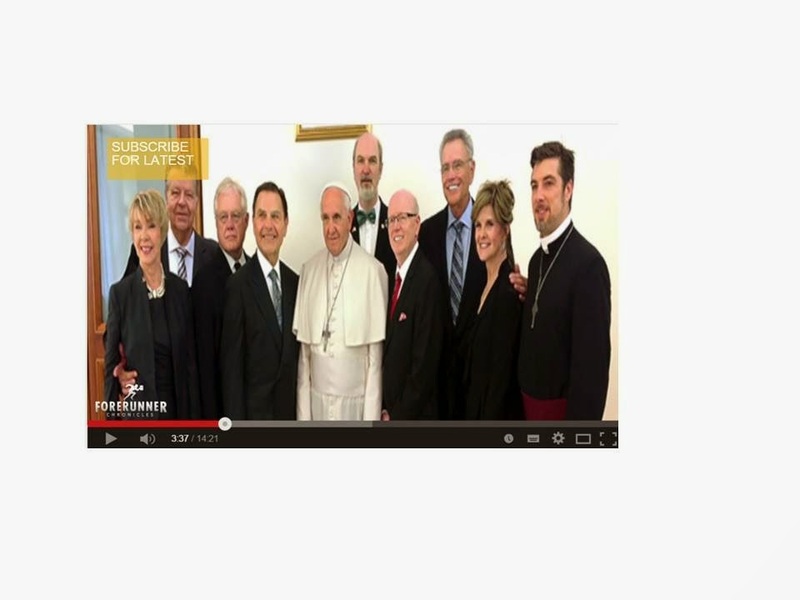 It also showed how Rick Warren will be joining the pope with other faith's religious leaders in the Vatican this month. In fact, I also show another video at the bottom of this article, showing Rick's adoration of the Pope, saying that anyone who likes this pope, will certainly love Jesus. This article now provides even further evidence that the rapture and Second Coming are extremely close by looking at the way that the apostasy of vast parts of evangelical and protestant Christianity has increased within the last year or so. What follows is absolutely shocking. On many of this blog's articles it gives evidence that the Word of Faith organisation was originally set up by Rome's agents using it to infiltrate protestant/evangelical churches by pretending to be protestant evangelical preachers. The blog mentions how the Word of Faith leaders are ecumenical, working with Rome and warned us to reject Word of Faith and come out of it. Well I now have the absolute proof of their intentions and allegiances on 3 videos below (re Jan 2014) and as indicated on the above photos which was taken some time after that event. I have now been made aware of something which happened at the beginning of this year, which is another massive step towards the apostasy of large parts of the charismatic section of protestantism joining Rome and therefore the strengthening of mystery Babylon - the one world global. religion. Word of Faith, parts of NAR and the Emerging Church/Seeker Sensitive movement (through Rick Warren) have now bowed the knee to Rome by declaring their absolute allegiance in unity. 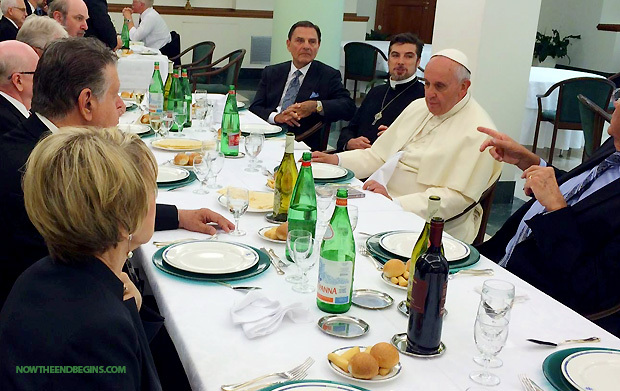 The second video is of Kenneth Copeland leading a Word of Faith conference for all the leaders of that organisation early this year in which the Pope and Word of faith made an open declaration of unity with Rome. In fact the response from Kenneth was astounding and looks very much like he was actually praying to the pope, by blessing and praising him and offering themselves with all their might. At one point in his prayer it was like he suddenly realised what it looked like and paused to change the tone: "we thank you sir (pause......) we thank God for you". You can find it from the 43m:39s point. The purpose of this article is to illustrate why the last 7 years before the return of Jesus could commence any day now and therefore that we need to make ourselves ready NOW. Note: the section "feast of trumpets" was edited on 17th & 23rd Nov 2014.
http://watchmanforjesus.blogspot.co.uk/2010/08/my-rapture-and-end-times-stance.html note: this article has now just been completely revamped with many changes due to the many errors discovered and to reflect what I now know to be true as at 14th November 2014 17.45 GMT. The bible tells us that the last 7 years aka the Great tribulation (mixed with the judgements of God) will precede the Second Coming, but these 7 years may not necessarily commence immediately from the day of the rapture, but from the signing of the 7 year peace treaty ("covenant of death") between Israel and the antichrist. Jesus told us that there would be signs pointing to the lead up to those days indicating when those days are likely to start. This article will not predict a date, but it will show that the signs Jesus was referring to are now here, so the rapture could happen at any time now. This article will show how the rapture is likely to happen just before or during the very next event on the prophetical calendar. I am referring to the Psalm 83 prophecy which could have the commencement of its fulfilment any day now (when we consider recent events in that area). This prophecy has never been fulfilled in the way described and by these specific limited numbers of nations (if we use 21st century equivalent names). By the way, it is not possible for the Gog and Magog wars (described in Ezekiel 38 and 39) to take place UNTIL the Psalm 83 war has first ended because it relates to the aftermath of Psalm 83. More on that later. The sun, moon and stars were not JUST to give light, days and years, but ALSO for signs and seasons. In a number of places through the Bible and through history we see momentous occasions when these bodies stand out specifically as signs of these events. Also, they dictate when specific seasons are upon us and when God’s specific feasts are at hand (which always paint a picture of Jesus [past, present and future] ). More on that later – especially regarding the feast of trumpets and tabernacles and how the phrase “as to the day and hour knoweth no man” fits in. Any teaching that states that a born again believer could lose his/her salvation if they do not continue until the end, is a heresy. It is a heresy because effectively that person has to depend upon their own works and efforts to retain their salvation, rather than just simply trusting in the Saviour for that prize. In fact, the reason this blog focuses so much on the evils of ecumenism is because vast areas of the "so called" evangelical/protestant church are embracing and/or joining forces with the work based religion of Rome (Vatican religion). Apart from ecumenism, there are those (within the evangelical church) who are being misguided, who follow arminianism. Arminianism was an offshoot from Rome (around the time of the reformation) and contains a lot of catholic teaching. No wonder really, because it has (at its essence, like catholic dogma) a dependence on works to maintain salvation. This article now focuses on why that teaching is heretical. The teaching of arminianism, is that it is possible for a believer to become saved and then later unsaved if they do not continue in the faith (including works evident of salvation) until the end. I will now show that this is a seriously false teaching and extremely dangerous to the spiritual health of believers and to their relationship with the Lord. There are those within the Christian community who state that the teaching of eternal security is not a teaching to be divided over, as it is a non vital doctrine, which does not affect our salvation. Is that true? I would beg to differ. It is time for us to change our behaviour and make a difference! If we are truly born again by God's Holy Spirit, then it should be evident by the way we conduct ourselves with each other. We need to show this world that true Christians are different. If we do so, maybe, just maybe they will listen to our message. There are far too many blogs/websites and contributors who do not express the love of God to each other, but get embroiled in needless angry, hateful retaliatory disputes on vital and not so vital doctrine. It is okay to earnestly defend truth, ESPECIALLY if it is over vital foundational truth, but even then it should be done with a humble, loving gracious, merciful attitude AT ALL TIMES!!!. Watchman, apologetics and discernment sites (if they are good, sound and reputable ones) rightfully focus on defending the faith and exposing error, heresy, apostasy etc and warning against false teachers according to the instructions in the New Testament to protect the church against wolves. This blog is no different and its main purpose is to do this - especially exposing ecumenical (Catholic), New Age, etc infiltration. However, THERE IS a right and wrong way to do this. We must always remember to speak the truth IN LOVE. I do hope that this blog DOES illustrate this. 1 John 2: 9-11 "He that saith he is in the light, and hateth his brother, is in darkness even until now. He that loveth his brother abideth in the light, and there is none occasion of stumbling in him. But he that hateth his brother is in darkness, and walketh in darkness, and knoweth not whither he goeth, because that darkness hath blinded his eyes." 1 John 3:17-18 "But whoso hath this world's good, and seeth his brother have need, and shutteth up his bowels of compassion from him, how dwelleth the love of God in him? My little children, let us not love in word, neither in tongue; but in deed and in truth." 1 John 4:20-21 " If a man say, I love God, and hateth his brother, he is a liar: for he that loveth not his brother whom he hath seen, how can he love God whom he hath not seen? And this commandment have we from him, That he who loveth God love his brother also"
The purpose of this report is to warn about Andrew Strom (who has a large following), giving evidence that he is STILL infected by NAR doctrine (aka as Latter rain) or is actually still secretly belonging to them and has ties with Rome. It is a warning because his teachings, visions etc are dangerous because they are mixed with much heresy. For more on NAR please click on this shortcut The New Apostolic Reformation. Why We Should Be Concerned About It Andrew says he has left NAR (New Apostolic Reformation) but his teachings, and over emphasis on reported visions, dreams, prophecies and desire to reintroduce apostolic ministry give the game away that he still belongs to it. Any joining hands (in direct or indirect ways) with the counterfeit Roman church, which came out of Babylon religion, is to be rejected!!! The reason that so many are now churchless is basically because of the influence of ecumenism, new age, mysticism, occultism etc etc on the evangelical church. We ARE trying to find a way of addressing this because we KNOW we need fellowship, but fellowship with what? Unity of true born again believers is not being questioned here. It is unity with false christianity that we dispute." I also tried to reply to someone who asked me a question but Andrew kept deleting it. I wonder why? 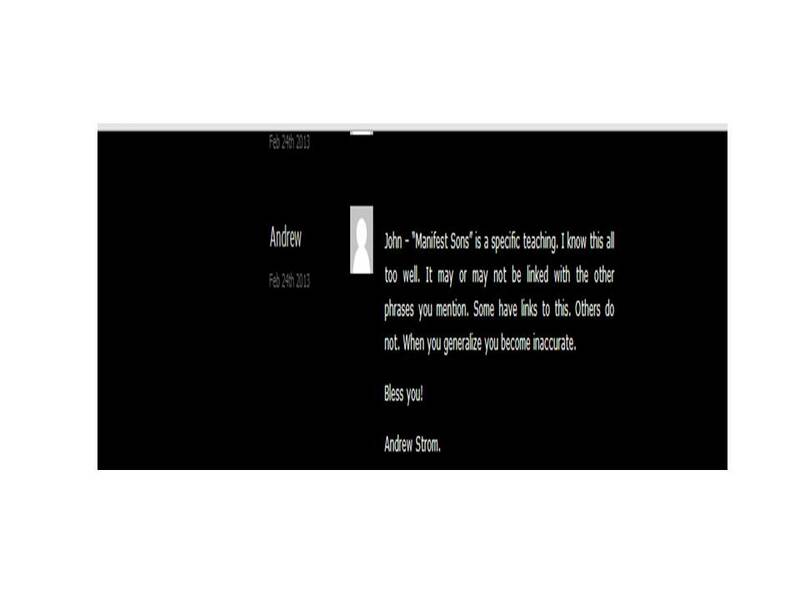 This is what Andrew wrote: I leave a screenshot (in case it gets removed). After he wrote this comment he banned me from commenting anymore. WHY? Has he got something to hide or afraid that he will be exposed. I emailed Andrew to ask him why he would not publish my latest comments and why I was banned, but instead of answering my question appropriately he simply accused me of something untrue. Here is the link to his comment. NIV 1984 Has Now Been Removed From Online Bible Sites (such as "Biblegateway", "Biblos", "bible.com","Bible.cc"). I looked at a few others - in all cases the same story. All of these are now ONLY listing The Corrupt 2011 Version. It has come to my notice that yet another evil is amongst us moving by stealth as part of the increasing apostasy. Many of us are aware in how our churches have been infiltrated with false teaching, counterfeit Christianity and paganism in increasing measures over the last 30 or so years. Those who are fundamental Bible believers (especially watchmen and discerners) have been working overtime trying to stem the flow of apostasy by declaring what THE BIBLE says. Up until recently the NIV 1984 version and other reliable older versions (such as the NASB and KJV) were still available on bible sites. Today, I have discovered that all the bible websites seem to have now removed the 1984 NIV version. I also noticed that other older revisions of some of the other reliable versions such as NASB and KJV also seem to have been removed. What we now seem to have remaining is: NIV 2011, KJV 2000, NASB 1995 as the most recent ones in stock. Even the NKJV is difficult to find on some sites. I guess that these will also soon be removed from Christian bookshops also. Soon, it will be impossible to buy any bibles which have not been increasingly corrupted by the money grabbing "christian" pharisees of the 21st Century. Please note my article on that subject by clicking here. For those who are not aware, the newer versions are not JUST a reprint but include modifications. These modifications range from very subtle changes to much bigger (more noticeable) ones. Mostly they are aimed to meet the demand for bibles that are more contemporary (i.e, more politically correct and more suitable to those with "itching ears"). Therefore, we ALL need to hold onto the REAL unadulterated TRUTH of God's Word as best as we can by RETAINING those older versions because SOON they will no longer be available. It is clear that the apostates are doing this deliberately so that the next generation can no longer recognise false teaching and therefore will be unable to oppose the false teachers - because their bibles are corrupted to suit these false teachers and allow them to flourish in even greater ways. In These days Of Apostasy and False Christianity, Should We Still Attend Apostate Churches? This blog has demonstrated, with clear evidence (over and over again) that the great majority of Christianity (including protestants and evangelicals) have become infected/infiltrated with apostasy. The apostasy includes an overwhelming acceptance of ecumenism, i.e. unity with the pagan Babylonian originated Roman Catholic church, and even ALL FAITHS unity, New Age thinking and much occult activity. The church of the 21st Century has widely compromised on the fundamental teachings from the Bible by putting greater emphasis on the physical, mental, psychic, mystic and “spiritual” EXPERIENCES rather than following after the pure, unadulterated, simplicity of the Bible and NT Christianity. Instead many simply open the bible randomly (when they do actually go to that extent) and collect their doctrine from isolated verses and WELL out of context, instead of comparing scripture with scripture and properly seeking to understand the context of why something was written. Instead they are taught to seek “experiencing the Lord” rather than seeking to know the Lord through His word and prayer. For more on this, see footnote below. In the light of these apostate days and apostate churches, SHOULD true born again believers STILL go to church? To find out, please click on the icon entitled "read more" below. Will The End Of the World Take Place on 21st December 2012? This is a brief article. I am not a prophet and am very careful not to make predictions. However, I can safely predict that there will be NO end on Friday 21st December 2012. Jesus said "as to the day and hour NO-ONE knows except my Father ........". He is saying that No-one can predict or "prophecy" when the end will happen. However, Jesus went on to say that there will be many signs pointing to a lead up to the end but no set day can be predicted, neither should it be predicted. The end will not come until GOD says so. which shows what the signs will be as to the end of the World. We are CERTAINLY in the last of the last days because MANY of the signs are being fulfilled in OUR day, but we STILL cannot predict the exact day, month or year - nor should we, but we must declare that the "figurative" ark is being built and those who are outside faith in the ONLY Saviour from sin i.e JESUS, should put their faith/trust in Jesus BEFORE it is too late!!! 2nd Aug 2016. I have been unable to spend time on this blog for a long time. The last few days I have had some available time, so have published and replied to some of the most recent comments which were awaiting in the queue. However, my time is limited. Please bear with me and still leave comments and I will address these as/when I can. There is at least one other site ALSO named LAST DAYS WATCHMAN but it DOES NOT BELONG TO ME. That site belongs to another entirely different author. I do not have any link to it. If you share this blog to others please refer them to "Last Days Watchman run by John Chingford" or found on "watchmanforjesus.blogspot.com". Also, please take a look down this column (left hand side bar) for other important information (including the "disclaimer") about this (my) blog. For a brief summary describing the contents of this blog please go to the very top of this page. You are permitted to distribute this blog and its contents, but before you do, please read the following first. We are living in increasingly terrible (LAST DAY) times of great deceptions. persecutions and suffering (as the Bible prophesied). The purpose of all the articles within this blog is to equip and motivate believers for these days. Therefore, please help by distributing this material as widely and quickly as possible. This is my conviction which I believe the Lord has given me. Occasionally, I get permission to display some copyright protected material within an individual article. If the excerpt within this article says "this portion of the article is copyright protected" then (and only then) please do not copy that portion of the article (although you can rewrite the key points, abbreviated form, in your own words) . This not only protects me but it also protects you from copyright action. if you have something personal or controversial to ask or discuss, ie. things which both/either of us would feel inappropriate to be shown on this blog. I will then reply to you privately from my email (outside this blog) with all confidentiality. To get to the MOST current page of this blog, please go to the top of this page and click on the "HOME PAGE" icon. The Menu list has been put together under different and specific subject headings. It is in a different sequence (specifically and deliberately intended) to those listed within "my labels" (below). Therefore it may still be useful to use "my labels" to find posts under different topics. My new facility showing the 25 most recent comments You will find these comments immediately below this notification. Click where it says "Continue" to access the comments. Jacob Prasch: A Vindictive Railer. Are These actions and Words Conducive Of A True Man Of God? Why God Required Animal Blood Sacrifice, In The Bible?